At Real Science, Steven Goddard claims this is the coolest summer on record in the US. The NOAA reports that both May and June were the hottest on record. It used to be the the media would reconcile such claims and one might learn something interesting from that reconciliation, but now all we have are mostly-crappy fact checks with Pinocchio counts. Both these claims have truth on their side, though the NOAA report is more comprehensively correct. Still, we can learn something by putting these analyses in context and by reconciling them. There are a number of different temperature data bases that measure the temperature in different ways (e.g. satellite vs. ground stations) and then adjust those raw readings using different methodologies. While the NOAA data base is showing all time highs, other data bases, such as satellite-based ones, are not. 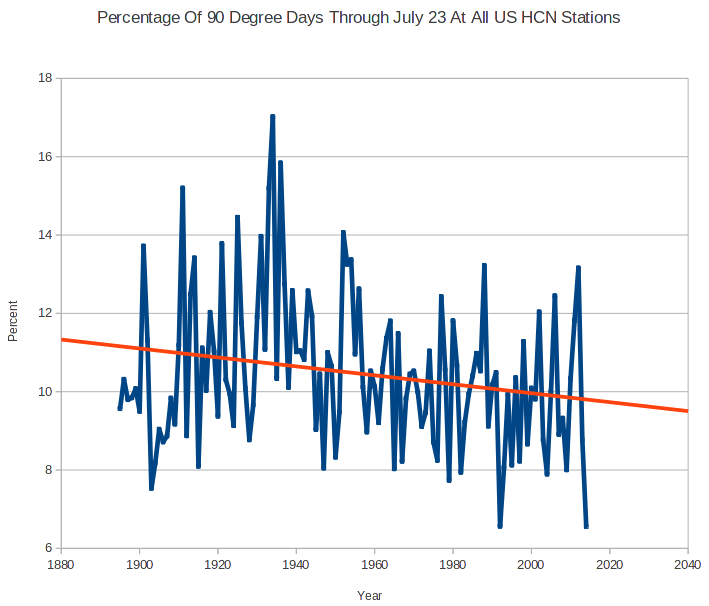 The NOAA database has been criticized for manual adjustments to temperatures in the past which increase the warming trend. Without these adjustments, temperatures during certain parts of the 1930's (think: Dust Bowl) would be higher than today. This was discussed here in more depth. As is usual when looking at such things, some of these adjustments are absolutely appropriate and some can be questioned. However, blaming the whole of the warming signal on such adjustments is just wrong -- satellite data bases which have no similar adjustment issues have shown warming, at least between 1979 and 1999. The Time article linked above illustrated the story of these record months with a video partially on wildfires. This is a great example of how temperatures are indeed rising but media stories about knock-on effects, such as hurricanes and fires, can be full of it. 2014 has actually been a low fire year so far in the US. So the world is undeniably on the warm side of average (I won't way warmer than normal because what is "normal"?) So how does Goddard get this as the coolest summer on record for the US? Well, the first answer, and it is an important one to remember, is that US temperatures do not have to follow global temperatures, at least not tightly. While the world warmed 0.5-0.7 degrees C from 1979-1999, the US temperatures moved much less. Other times, the US has warmed or cooled more than the world has. The US is well under 5% of the world's surface area. It is certainly possible to have isolated effects in such an area. Remember the same holds true the other way -- heat waves in one part of the world don't necessarily mean the world is warming. First, I will say that I am skeptical of any chart that uses "all USHCN" stations because the number of stations and their locations change so much. At some level this is an apples to oranges comparison -- I would be much more comfortable to see a chart that looks at only USHCN stations with, say, at least 80 years of continuous data. In other words, this chart may be an artifact of the mess that is the USHCN database. However, it is possible that this is correct even with a better data set and against a backdrop of warming temperatures. Why? Because this is a metric of high temperatures. It looks at the number of times a data station reads a high temperature over 90F. At some level this is a clever chart, because it takes advantage of a misconception most people, including most people in the media have -- that global warming plays out in higher daytime high temperatures. But in fact this does not appear to be the case. Most of the warming we have seen over the last 50 years has manifested itself as higher nighttime lows and higher winter temperatures. Both of these raise the average, but neither will change Goddard's metric of days above 90F. So it is perfectly possible Goddard's chart is right even if the US is seeing a warming trend over the same period. Which is why we have not seen any more local all-time daily high temperature records set recently than in past decades. But we have seen a lot of new records for high low temperature, if that term makes sense. Also, this explains why the ratio of daily high records to daily low records has risen -- not necessarily because there are a lot of new high records, but because we are setting fewer low records. We can argue about daytime temperatures but nighttime temperatures are certainly warmer. 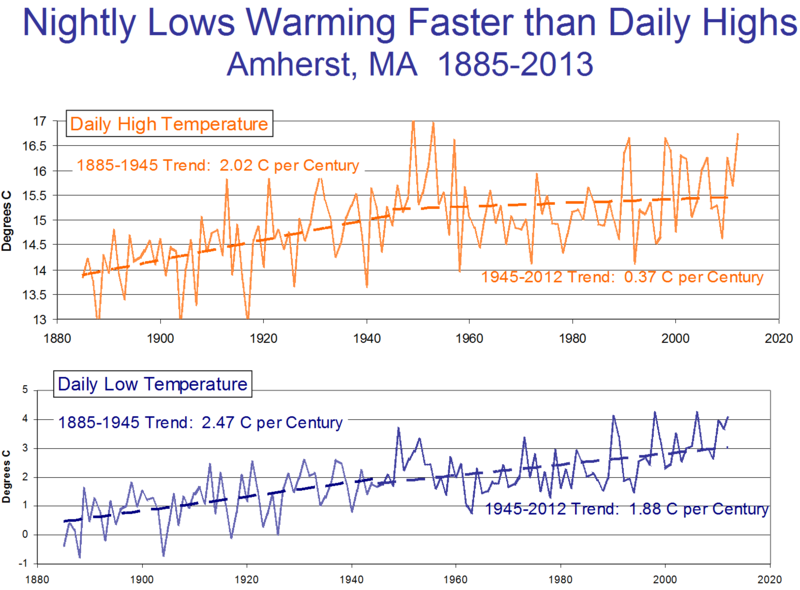 This chart shows an example with low and high temperatures over time at Amherst, MA (chosen at random because I was speaking there). Note that recently, most warming has been at night, rather than in daily highs.